After leaving Black Rock Mountain State Park I went home got Jean and we drove to the Great Smoky Mountains National Park. The park is about 1 hour from home and we go there often. This, however, is the peak of the wildflower season in the Smokys. 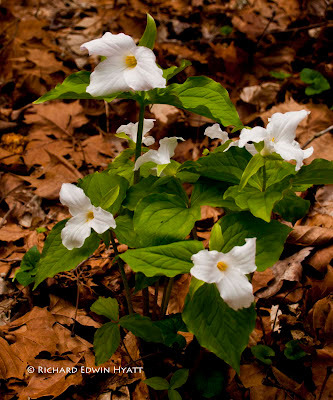 Especially, the Trillium wildflowers. First stop was near the Collins Creek Picnic Area. This is normally the firs place we see trillium in bloom each year. Not so this year. The first trillium we saw was on the Tennessee side of the park. 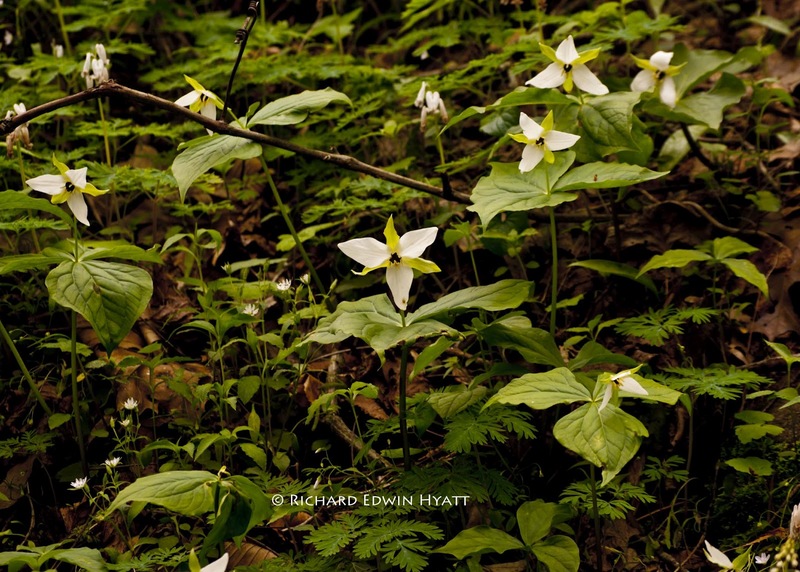 Now, Collins Creek is loaded with Great White Trillium, Trillium grandiflorum. These are in the photo on the right. Notice the center parts are yellow. In all three of these trilliums notice that the flower stands well above the whirl of three leaves of the trillium. This helps in identification of the this wildflower. Of course in the case of the Stinking Benjamin, you could get down and smell the smell of rotting meat to make the identification. This smell attracts carrion seeking flies and insects that help pollinate the flowers. To the left are White Erect Trillium, Trillium erectum found just before the entrance of the Collins Creek Picnic Area.